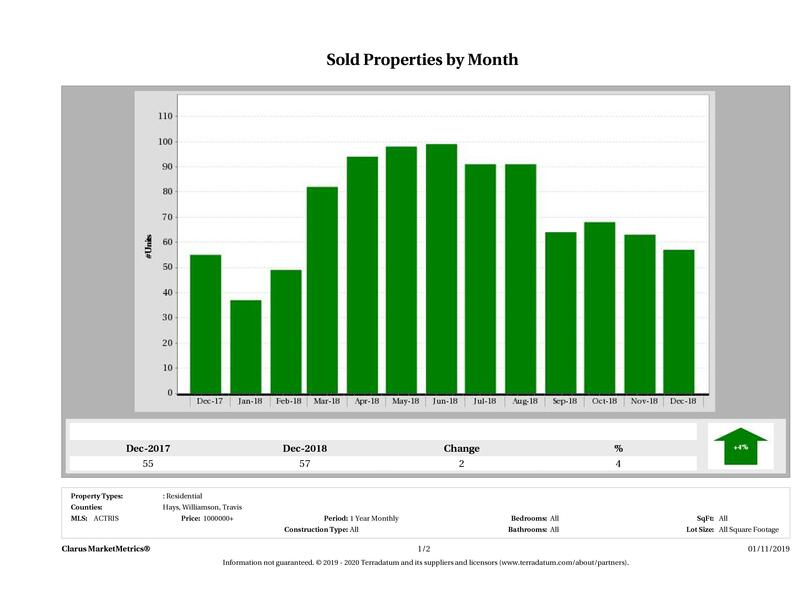 Eleven Oaks Realty is proud to present their December 2018 Austin Luxury Real Estate Price Report measuring market activity in the Austin area single family home market priced at $1 million or over. 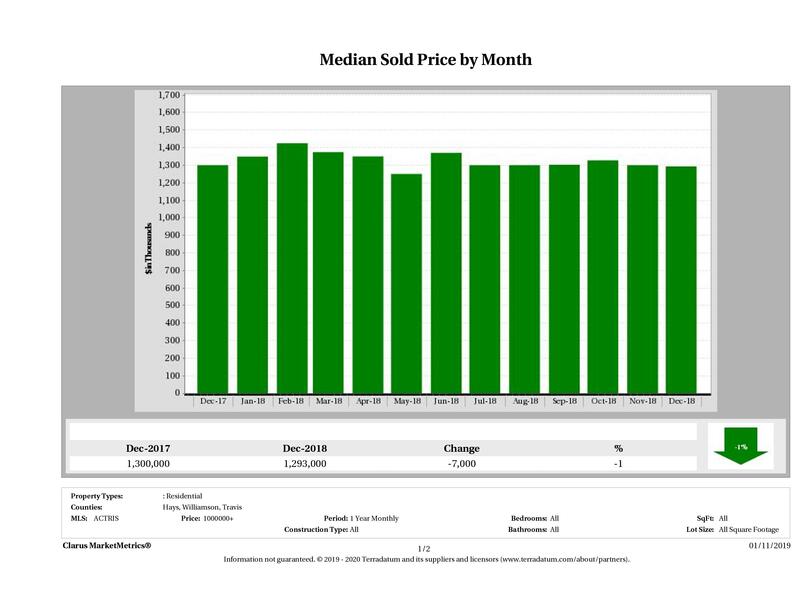 The December 2018 Austin Luxury Real Estate Price Report covers the luxury market in the following Austin metro area counties: Travis, Williamson and Hays. In December 2018, there were 42 luxury homes introduced to the market compared to 37 in December 2017, marking a 14% (5 home) increase in year over year numbers. 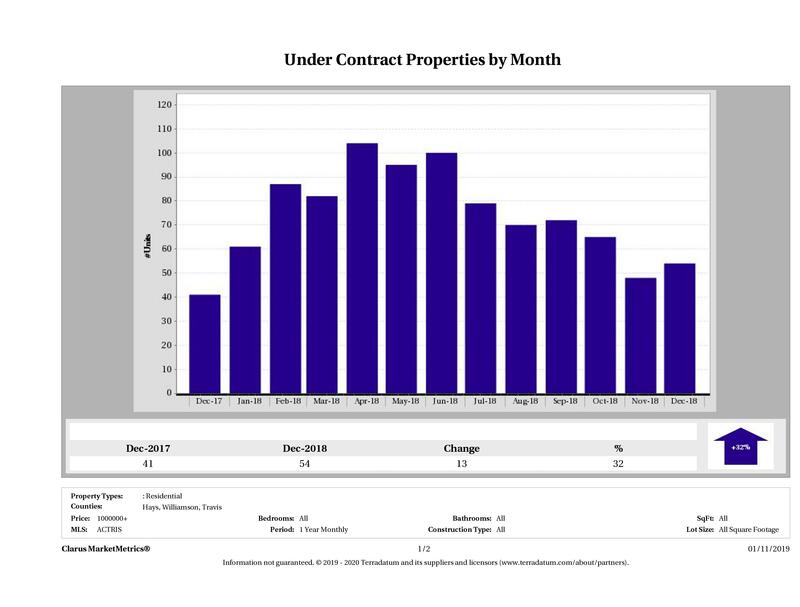 In December 2018, 54 luxury homes went pending in the Austin area compared to 41 in December 2017, marking a 32% (13 home) increase in year over year numbers. In December 2018, 57 luxury homes sold compared to 55 luxury homes in December 2017, marking a 4% (2 home) increase in year over year numbers. 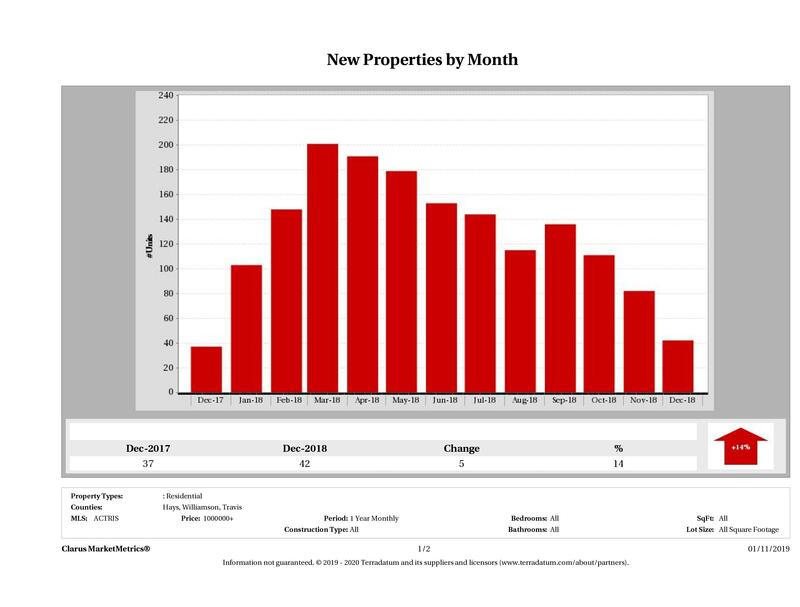 In December 2018, there was 8.8 months of inventory on the Austin luxury real estate market compared to 12.4 months in December 2017 – a 29% decrease in year over year numbers. 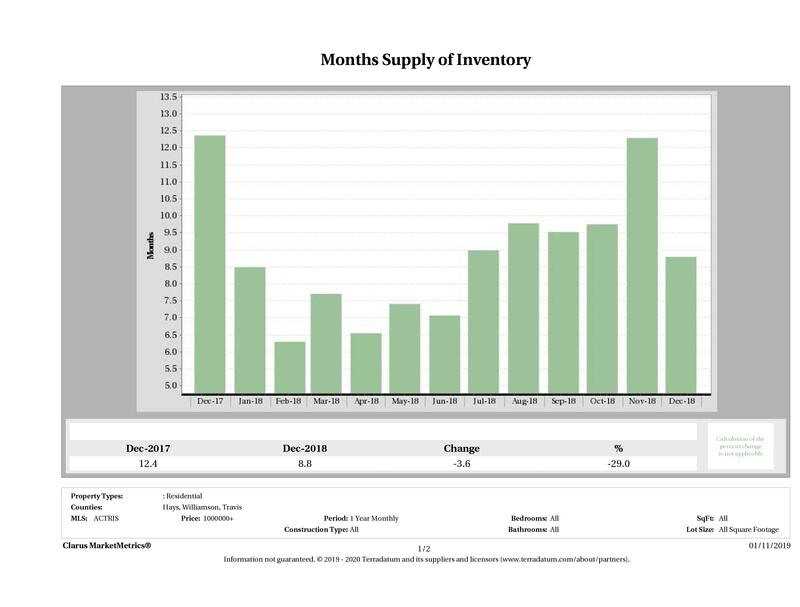 This month we saw a substantial dip in inventory in both year over year and month to month figures. With the slight increase in demand and increase in number of luxury homes taken off the market, inventory dipped. 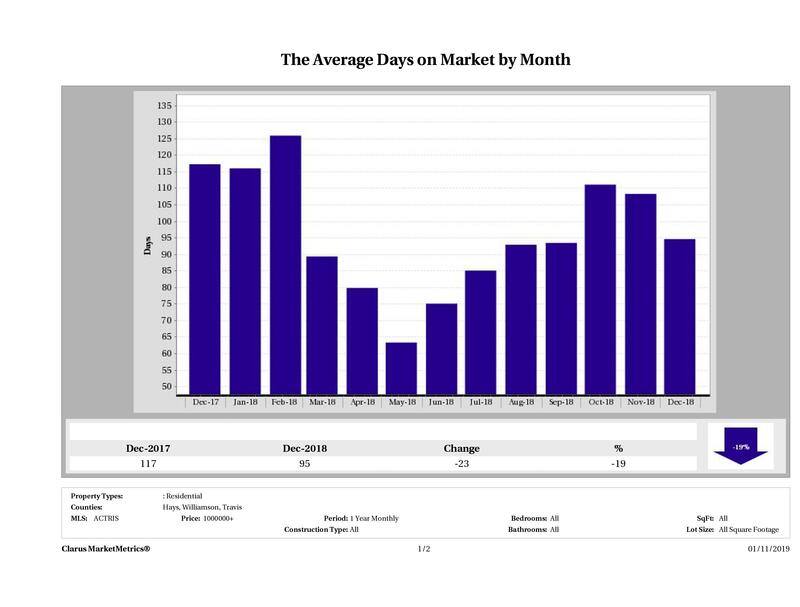 In December 2018, it took 95 days to sell a luxury home in Austin, on average, compared to 117 days in December 2017, marking a 19% (23 day) decrease in year over year numbers. This month, the median home sale price of a luxury home in the Austin area saw a 1% decrease in year over year numbers. The median home price in December 2018, when you consider homes that sold for $1 million or more, was $1,293,000 compared to $1,300,000 in December 2017. In December 2018, there were 632 luxury homes for sale in the Austin area, compared to 627 in December 2017, marking a 1% increase in year over year numbers. In December 2018 there were 103 luxury homes taken off the market compared to 79 in December 2017, showing a 30% (24 home) increase in year over year numbers. December is usually a big month for homes being taken off the market. Some of them are re-listed in January and others are not. It will be interesting to see how the market shakes out early next year. 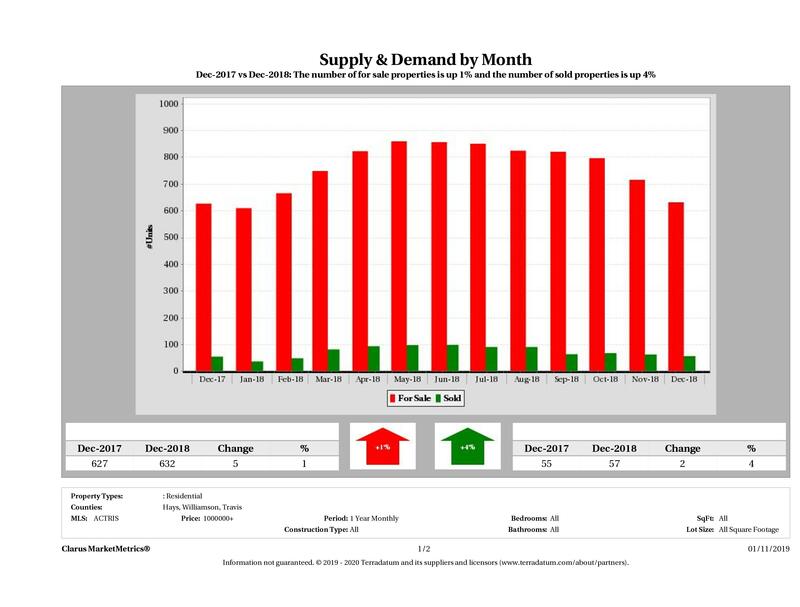 This month we saw a 1% increase in luxury housing supply (number of properties for sale) and a 4% increase in luxury demand (number of sold properties). 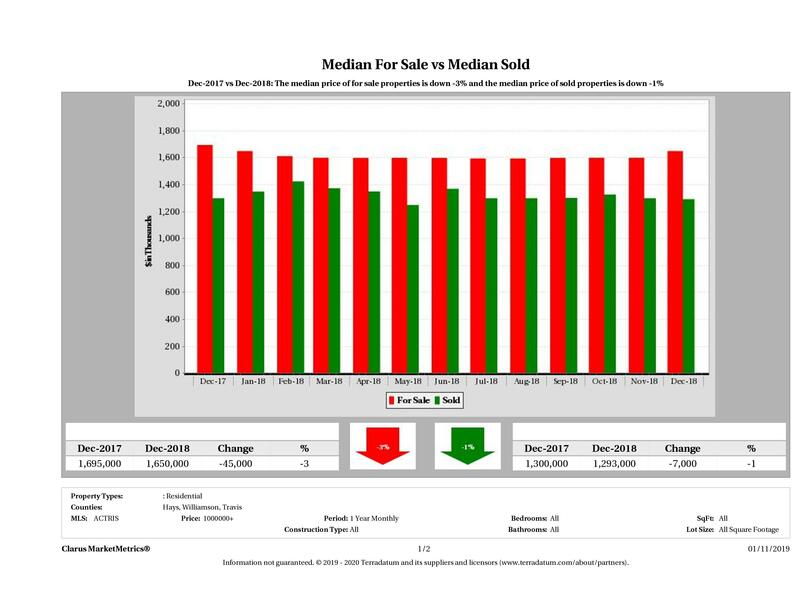 In the Austin area, we saw a 3% decrease in median for sale price of a luxury home, while the median sold price of a luxury home saw a 1% decrease in year over year numbers. The median for sale price of a luxury home was $1,650,00 in December 2018 compared to $1,695,000 in December 2017 marking a $45,000 decrease in year over year numbers. The median sold price of a luxury home was $1,293,000 in December 2018 and $1,300,000 December 2017, showing a $7,000 decrease in year over year numbers. 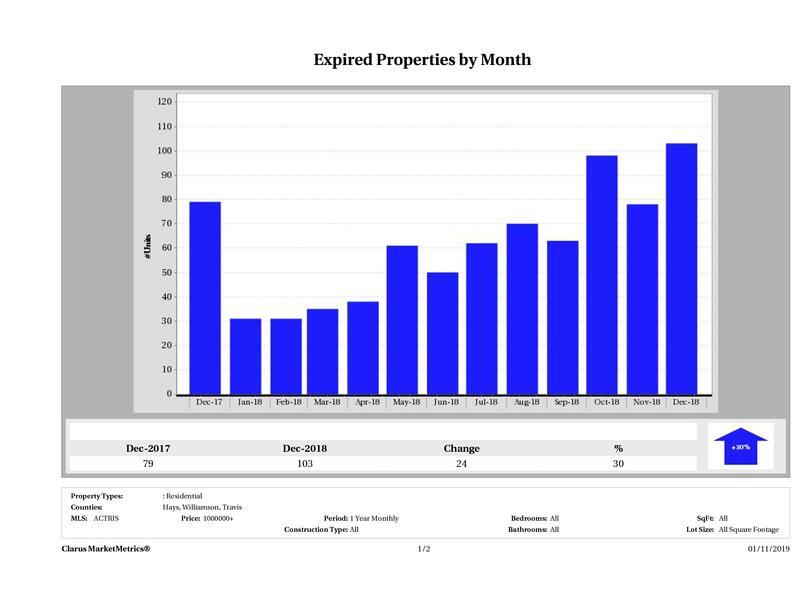 All of the Austin luxury single family homes that sold in December 2018 were west of 35, south of 183 (with the exception of 2) and north of 290 (with the exception of 4). 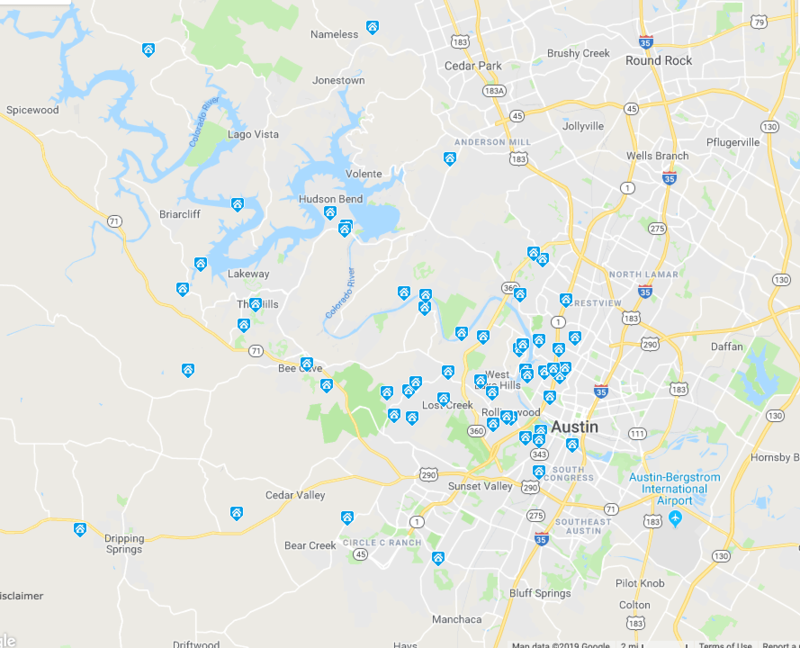 Here is a map of the 58 Austin luxury homes that sold in December 2018. Here is some additional data on the 58 luxury homes that sold in Travis, Williamson and Hays Counties in December 2018. These 58 homes sold for $1 million or more. 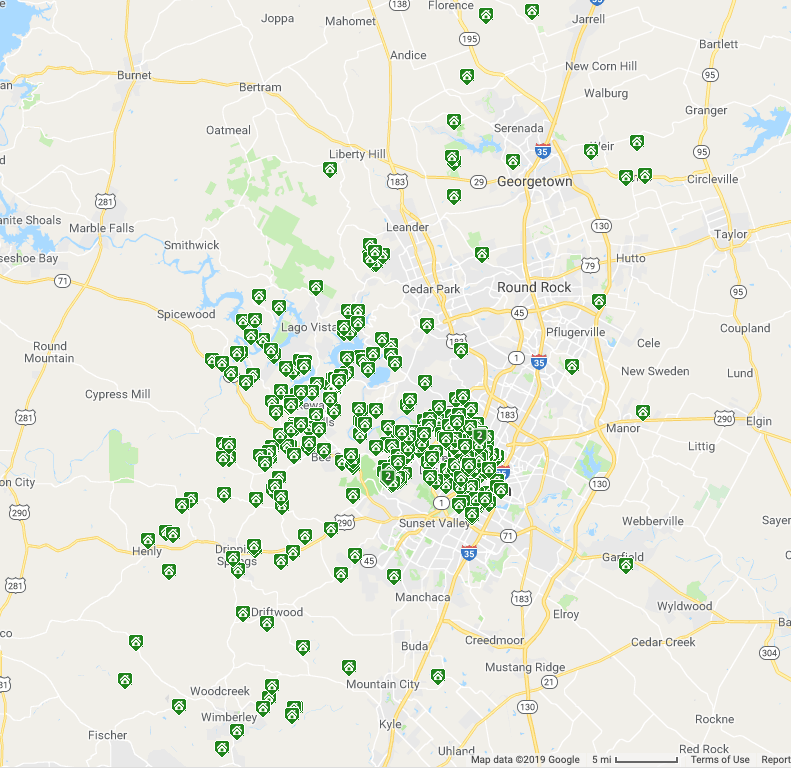 Here is a map view of the 378 luxury homes currently for sale in the Austin area as of January 11, 2019. 325 are located in Travis County, 14 are located in Williamson County and 39 are located in Hays County. 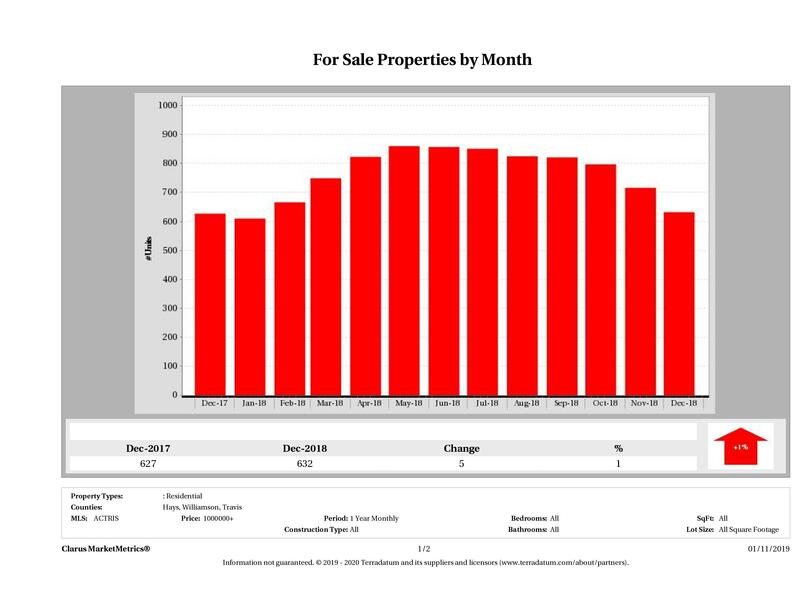 For those of you who prefer to see the actual numbers, we’ve listed the figures for December 2018 Austin area luxury home sales below. The most expensive luxury home that sold in December 2018 sold for $3,775,000 and the least expensive luxury home sold for $1,025,000. Austin luxury homes ranged in size from 2,202 sqft – 7,653 sqft with an average size of 4,315 sqft. The average price per square foot for a luxury home that sold in Austin in December 2018 was $368.12 with the lowest being $193.53 /sqft and the highest being $672.91/sqft. It took, on average, 104 days to sell a luxury home in Austin and sellers received, on average, 93.21% of their original list prices.